A wall of silent resentment shuts you off from someone you love... You listen to an argument in which neither party seems to hear the other... Your mind drifts to other matters when people talk to you... People Skills is a communication-skills handbook that can help eliminate communication problems. It describes the 12 most common communication barriers, showing how these "roadblocks" damage relationships by increasing defensiveness, aggressiveness, or dependency, and outlines the effective skills for listening, asserting yourself, resolving conflicts and working out problems with others. Full of practical ideas, People Skills can help you strengthen meaningful ties. Your family can become closer, your friendships warmer and your work relationships more productive - all by improving your communication skills. 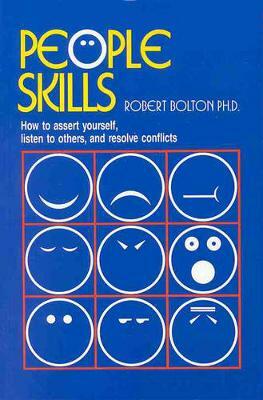 Bolton explains how to acquire the ability to listen, assert yourself, resolve conflicts, and work out problems with others. These are skills that will help you communicate calmly, even in stressful emotionally charged situations.